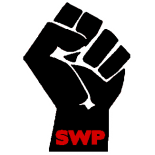 Members of Leicester SWP had been campaigning hard to get as many people as possible down to the National Demonstration Against Austerity. The March was called by the Trades Union Council (TUC) which is the governing body of all Trade Unions in Britain. 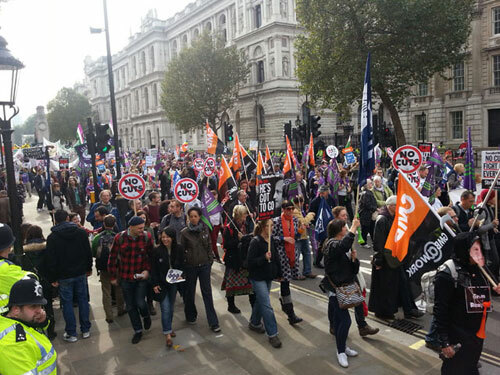 The march occurred just a few weeks after a number of more left leaning trade unions tabled motions calling for a General Strike to stop the Tory onslaught of cuts & austerity measures and against mass privatisation programmes. The fact that these calls for a general strike were even heard by the TUC is an indication that their is a mood amongst many trade unionist to fight the cuts. The National Demonstration in March last year was no doubt bigger than the national demonstration on 20th October but what was striking about this demonstration was the fighting mood of those that attended this time. Despite pessimistic overtures about a low turn out for this national demonstration 200,000 people marched through the streets of London with placards, banners, huge helium Balloons serenaded by thousands of belugas, whistles and drums. From the outset the mood was buoyant and determined with people virtually chanting for the whole of the march. There was a sense of a emerging recognition of a class identity on this demonstration and this was reflected in the popularity of chants calling for Starbucks to pay their taxes. Equally the enthusiasm of the marchers singing “I’d rather be a pleb than a toff” clearly illustrated the feelings of polarity between those that marched that day and the elite class that sit in 10 Downing Street. The march finished at Hyde Park with a number of militant speeches calling for escalation of action and a move to more generalised strike action. the only negative aspect to this day was unsurprisingly speeches made by Ed Milliband and promised that a future Labour Administration would continue with the cuts but these cuts would be ‘smarter’ and more ‘strategic’. Little surprise then that this speech was met with a chorus of boos from the crowd. It is clear that it is vitally important to continue to build on the size of these demonstrations as taking part in them leaves you with little doubt about the power of ordinary people to bring about change. Every extra person brought to such events will be one more that is pulled into the fights ahead. However what is also clear is that mass demonstration alone will not defeat the Tories or persuade a future Labour Government from implementing cuts. Instead there is a real need for socialists on the ground to argue for the importance of coordinated strike action as the most important tool to bring about real change. This entry was posted on Nov 13, 2012 by leicesterrtw in Socialism, Uncategorized and tagged communism, left-wing, leicester, politics, socialism, socialist, socialists.